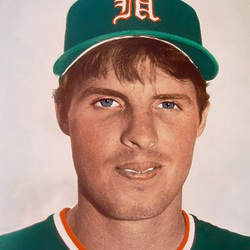 Phil Lane blasted 62 home runs in three seasons at the University of Miami, including 25 during the Hurricanes first national championship season in 1982. Both were school records at the time. He also set a UM record when he homered in 5 consecutive games in 1982. Lane was third, that the time, on the Hurricanes all-time list in total bases and walks. Lane will always be best remembered for swinging a hot bat when they needed it the most. At the 1982 NCAA Regional Tournament, Lane hit a 500-foot shot over the light tower at Mark Light Stadium. He was named MVP of the 1982 Regional. At the 1982 College World Series Lane batted .421 with three home runs, seven RBI's and a .947 slugging percentage where he was named to the CWS all-tournament team and the where the Hurricanes won their first baseball national championship.